In honor of the newly released Pathfinder Tales novel King of Chaos, we've pulled out all the stops and asked noted reviewer Mordicai Knode to do a new interview with Dave Gross, the author behind Count Jeggare and Radovan, two of the most beloved characters in the Pathfinder universe! In 2010, Mordicai Knode was the first person to post a review of Prince of Wolves after galleys went out at the American Book Association in New York. Since then he has written a comprehensive review of the first three Radovan and the Count novels as well as the very first review of King of Chaos at tor.com. Let's get this started with a chicken or the egg question: Who came first in your imagination, Radovan or Varian? The story sketch that became "Hell's Pawns," a serial novella originally appearing in the Council of Thieves Adventure Path, was based on a pitch I'd previously sent another editor a few years earlier. He took eight months to respond and then quietly vanished from said publisher, so the story sketch lingered in my ideas folder. Since that pitch centered on a noble figure that later became Varian, you could argue that he came first. However, for Pathfinder I reworked the outline both to set it in Golarion and to freshen it up. At that stage I'd decided to tell the story from two alternating points of view, but when I began outlining I realized I had room enough for only one. Taking the Holmes and Watson stories as a model, I decided it was more interesting to tell the tale from the POV of the assistant rather than the detective. And then, because I'd been watching a lot of film noir the previous month and felt a tough-guy sensibility worked well in the capital city of Cheliax, I adopted the attitude of a hard-boiled antihero for Radovan. Thus, the existence of a character like Varian came first (and in fact, Varian might have been his name in the previous incarnation), but the tone and personality of Radovan came together before I fleshed out the count. Were there any interesting variations in the characters as you shaped them? Was Radovan always part-devil, was Varian always a half-elf who threw up when he tried to cast a spell? Did they go through versions and drafts where they were profoundly different, or did they step fully formed onto the page, like Howard and Conan? Varian was always an armchair wizard, although the exact nature of his disability evolved after "Hell's Pawns" when I first started conceiving Prince of Wolves. Other details, like Varian's and Radovan's mutual worship of Desna, or Lady Luck, were seeds I planted toward a vague end that started taking shape when I outlined the first novel. From the start, I wanted both Varian and Radovan to be of mixed parentage. In pitch stage, Radovan was a half-orc with a vaguely East Asian name. James Sutter told me there was another half-orc in the works for Pathfinder fiction and suggested I make my character what we now call a hellspawn. Hell-wrought half-breeds are more common in Cheliax, where devils have supplemented the human legions for the past few generations. Of course, being perverse, I decided that, while Radovan was hellspawn, he wasn't descended from a devil in Cheliax. When it came to the name, when James suggested a Tian (Pathfinder's equivalent of Asian) name was a bit too unusual for Cheliax, I went to one of my other favorite cultural analogs: the Ustalavs, similar to Eastern Europeans. Radovan was not the first name I considered, but the moment I typed it, I knew it was right for the character. The secret of Radovan's ancestry was just a vague idea when I was writing "Hell's Pawns," but by the time I was outlining Prince of Wolves, I had generated a few pages of notes about the centuries preceding his birth. His secrets have been coming out one big blossom at a time in these four novels. I keep a growing secret timeline and notes for future revelations. With what's revealed in Queen of Thorns and King of Chaos, Varian is starting to catch up with Radovan in terms of learning, "What is wrong with me?!" "Anachronistic" always strikes me as a funny word to apply to an alternate world. Sure, there are some striking similarities between many of Golarion's cultures and those of the real world, but the stories aren't taking place in our past. Still, I get what you mean. Some readers think fantasy occurs only in Middle-Ages or Renaissance Britain. I like to choose dialect and tone to suit a character or a region of the setting. For instance, Radovan, as a lower-class Chelaxian, speaks with a kind of low-class, pulp-era attitude, while Varian wouldn't seem out of place if he walked onto the set of Downton Abbey. I try to make the elves look and sound different from the crusaders without making them all sound like some near-variation of Tolkien's creations. As for bringing in non-standard-fantasy influences, I'm not anywhere close to the first writer to do that. I think it's been in fantasy since the beginning, but the popularity of the Tolkienesque model makes us forget they exist. The writer who first opened my eyes to a different model for fantasy was Roger Zelazny, whose Corwin of Amber was, I believe, partly inspired by the Travis McGee novels of John D. McDonald. Also, I just like to write about the stuff I love, which in addition to fantasy adventure includes things like classic horror films, wuxia movies, and detective fiction. I like dogs, so there's a dog. I like jokes, so there are jokes. And while I'm not a violent person, I enjoy action scenes, both the swashbuckling ones and the gritty ones that make you sick of fighting. Once on a convention panel, one of my colleagues suggested that blending genres—like humor and horror in the Buffy the Vampire Slayer TV series—was a recent trend. I noted Abbot and Costello meet Frankenstein, as well as Bob Hope in Ghost Breakers, and that was enough to persuade him that we've been crossing the streams for ages in film, but it's been with us in all art forever. This idea of keeping a genre "pure" seems like a recent invention of booksellers who want to keep the shelves organized, made worse by sales and marketing people who want to focus on narrow categories to make their jobs easier and maximize sales. Part of the reason I love Asian movies, and many other movies made outside of Hollywood, is that they so often don't obey the one-genre rule. The closest I've come to a "regular" fantasy novel is probably Queen of Thorns, although King of Chaos is also not as noticeably stream-crossing as the first two books. You write about Varian and Radovan in a number of different formats—serialized in printed adventures, ebook novellas, online serials, and plain old-fashioned novels—and they are all fully integrated into your stories. Kasiya, the mummified vampire antagonist of King of Chaos, originally appeared in "A Lesson in Taxonomy" online, for instance. How do you approach the different formats, and how do you see your writing evolving in response to it? Foremost in my mind is the importance of keeping the stories independent of each other. It might be fun to read them chronologically (except "A Lesson in Taxonomy"—don't read that one first), but the scheme is that you can come into the setting and the characters from any one of those doors. Frankly, I think some are more successful at that than others. To new readers I tend to recommend Prince of Wolves, since it's a solid foundation for both the characters and the setting. Still, although you'd be coming in on the fourth "season," you should be able to start with any of the short fiction or novellas, and now especially King of Chaos, and not feel lost. The short stories are the most difficult and in some ways the most rewarding of the stories. I always find myself stripping away subplots and details I wanted to include but couldn't without muddling a short piece with too much incident. I much prefer the room allowed in a novella or novel, in part because I love subplots and small character moments that don't at first seem relevant to the story, but when you look back at them, you go, "Oh!" After writing a short story, I always feel energized to write a better single chapter in the next novel. While the novels aren't a series of short stories, I admire the way George R.R. Martin makes so many of the chapters in his Song of Ice and Fire such strong, stand-alone stories, even when he leaves them on a cliffhanger. I am certainly moving toward emulating that structure as I go forward. Have you decided what posterity should call the series? "Radovan and the Count"? "Varian and Radovan?" While I prefer "Radovan and the Count" for I don't know why, I also use R&J or R&V for shorthand. My editor, James Sutter, tends to use Varian and Radovan or vice versa. I don't know that it's important, but I tend to leave off Radovan's surname because it's a plot point in Prince of Wolves. If you could send Radovan and the Count to any non-Pathfinder setting, what would you pick? Extra points for increasing specificity! Now there's a question I've never considered before. Let's immediately disqualify any of the nascent settings I've been sketching out for original work. The boys would fit in very well to Leiber's Nehwon or Zelazny's Amber, I bet. And they wouldn't be entirely out of place in the Forgotten Realms. Now I wonder whether they'd be a natural fit for the Iron Kingdoms. Because I've chosen areas in Golarion in part because of their resemblance to real-world locations (Ustalav as Eastern Europe, Tian Xia as Asia, Cheliax as imperial/infernal Rome), a very loose historical setting might work, although for some reason that one seems weirder than the near-fits of other fantasy worlds. Maybe it's because of the high level of magic the boys have encountered in Golarion. So, Dave, what is the craziest thing you've ever done as "research" for a book? While it doesn't seem crazy to me, my wife's eyes still bulge when I mention the 140 kung fu movies I watched or re-watched before, during, and long after writing Master of Devils. Fortunately, a surprising number of them are good, and an even larger number were cheap. From another angle, the craziest thing I've done is learning a 10-year-old setting over a period of just a few months. Granted, I had a lot of help and handholding, but that's the one that felt like walking a high wire over a pit of fast-zombie tigers. Do you consider Radovan and the Count to be "gaining levels" as the books progress? It's a very high-level world, but as they go along in their stories—learning more about their abilities, and picking up new tricks—it seems that they are getting more capable, and more organic. Does that meta-fiction constraint, of experience and levels, factor in to your mental calculus for the characters? But remember that they're both gaining and losing levels, learning new abilities and losing some because of "reasons." You're right to call that an instance of meta-fiction, but it's not always a constraint. Sometimes the Paizo developers and editors let me explore new directions with the rules, as long as there's a story reason for it that still connects to the magic "physics" by story logic. For instance, the whole business of Radovan's journey in Master of Devils brings him to a truly frightening level of physical threat, but all he wants is to be free of the thing that gives him that power. The outcome of that journey haunts him in Queen of Thorns and makes him look back on his brutal upbringing. Sometimes the thing he hates the most is what he's been taught to be, what he's "built for." Likewise with Count Jeggare's magical "disability." In game terms, there's no reason he shouldn't be able to cast spells, but I proposed a reason for his problem to James Sutter very early on. In King of Chaos, I finally get to reveal why he's been handicapped all these decades. But if you know the character, you can already imagine some of the psychological obstacles he'll to continue to face even though he seems at last to understand the true nature of his magical ability. If I can use the game mechanics to reflect a character's internal conflict, that's what I try to do. Conan winds up on the throne. We all know that; we know that even when we read Conan stories from when he was a pirate or a thief or a mercenary. Do you know the eventual fate of the Count and Radovan? That said, I have a ridiculous number of story ideas cluttering my head, some of them focusing on the boys, but others featuring some of the secondary characters from their novels. There are experiences I want each of them to have, tests I'd like to see them face, losses they need to suffer... and, to be perfectly honest, also some Golarion-shaking events I'd like them to be a part of if and when the time comes that the shepherds of the world are ready to release that particular catastrophe and will invite me to put the boys into play. I've shared a short wish list of these events with James Sutter, James Jacobs, and Wes Schneider. One day maybe I'll get an email that begins, "You know how you said you'd like to write something involving the return of REDACTED or a war between REDACTED and REDACTED? That time is nigh!" Dave Gross recently launched a new website at www.bydavegross.com. There you can read the second part of this interview as well as the beginning of a Radovan & the Count retrospective. Don't forget to sign up for the free newsletter and a chance to receive free books. Mordicai Knode lives in Brooklyn, where he runs campaigns involving generation ships haunted by vampires, samurai addicted to the spice mélange, and Neanderthals instead of orcs. He writes for Tor.com, most in a series exploring Appendix N, Advanced Readings in DandD. You can find him on Twitter and Tumblr. I think that Paizo had a lucky hand when they picked Dave Gross to spearhead Pathfinder Tales. Radovan and Jeggare both make for very entertaining reading - and, to my mind, Dave Gross just hits that sweet spot of making his Pathfinder novels reveal secrets and reach scope that the shepherds of Golarion jealously guard. Thanks for the far-too-kind words. I feel (some of) your pain on international shipping ever since moving to Canada. And occasionally I'll send a package overseas, and it hurts even more. It's one of several reasons my electronic library has begun growing faster than my physical one, although I can't imagine ever giving up on printed books entirely. They smell too good, and they're easier to autograph. Speaking of eBooks and autographs, I signed my first eReader at Gen Con this year. I can't decide whether I feel more important or more like a vandal. I've always thought of you more as a Hun. Outside of southern restaurants and my wife, only you get to call me Hun. I guess I wear enough black to count as a Goth. Hi, Dave, how is your writing going for The Grande Temple of Jing? It is my current project. My last one was a bit dark, so this one will be light. And then the next one will be very, very dark. And then I'm set to work on something special for Christina Stiles. Fans of Prince of Wolves and Black Wolf will enjoy that one. It'll be dark on the outside but light on the inside, like a Ho Ho. And then my desk is clear, if only briefly, and I'm back to novels. I found that I have only been able to read full fledged fiction books in digital format when there is no reasonable other option. Like when I'm sick in bed and have run out of paper stories. I kind of like reading from my iPad, but on my most recent flight I took a proper book so I could read on take-off and just prior to landing when they make you turn the electronics off. By the bye, I recently posted a retrospective on the earliest adventures of Radovan and the Count, from "Hell's Pawns" to Prince of Wolves, the first Pathfinder Tales novel. After I see ten or more comments or questions on that post, I'll write another on "A Passage to Absalom," "Husks," and Master of Devils. Captain, you should be fine; the books aren't quite stand-alone, but if you know who Radovan & Varian are & vaguely remember what they were up to, you'll be fine. It is a wholly separate story. Though I have to ask...why aren't we supposed to read "A Lesson in Taxonomy" first? Just wondering because I've seen Dave mention this more than once. It's much better to read "A Lesson in Taxonomy" after the first two or three stories because the irony of Jeggare's changing values works better if you see "modern" Jeggare first. To a lesser extent, the same is true of "The Fencing Master." I think the story still works if you read it first, but those who've encountered the boys in publication rather than chronological order will experience more dramatic irony. This just makes me think of the Chronicles of Narnia & how I am SUPER JUDGMENTAL about them & how I DEFINITELY HAVE OPINIONS on what order they should be read in & sold in. Which is to say, PUBLICATION ORDER NOT CHRONOLOGICAL ORDER. The books published later even explicitly reference the books published earlier! Come ON. Like people have never heard of prequels before. As the kids say, hashtag #SMH. 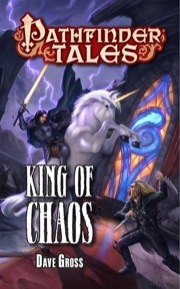 Many thanks to Mordicai, not only for the glowing review and the delightful interview, but also for working with Paizo's Jenny Bendel to give away 10 copies of King of Chaos over at tor.com. What, you haven't entered to win? Go there now! SF Signal is also hosting a giveaway. Go enter their drawing, too. You already have a copy? Enter anyway, and pass along one to a friend. If you're one of the winners, I hope you'll post your victory whoop here. Seriously, if you haven't entered to win a free copy of King of Chaos yet, you totally should! I entered them both! If I win, I'll give the free copy away to a friend in my office. Free? The motto of chaos! Hah! I found an email in my inbox this morning stating that I won! I am a winner. I am a winner! I am a WINNER! Since I already have a copy of the book, I'll give it away to a friend as "word of mouth advertising." Guess what? Me too! I had to e-mail John DeNardo over at SF Signal, to make sure it wasn't a joke, and he confirmed it. I BE A WINNAH, TOO !! It's really good to see some Paizonians winning those giveaways. Woo Hoo! My free book arrived last night. I'll be loaning/giving it to a coworker when he gets in to work tomorrow. King of Chaos was a really fun read.